At NWSS, there’s a place for everyone, thanks to the school’s Best Buddies Club – and a national Shaw Grant of $5,000 to create a Games Room. The grants are being awarded to 10 schools in Canada with ideas that best encourage empathy, inclusivity and respect. November 22, 2018 – New Westminster Secondary School students Simran Grewal and Kate Choi wanted to make it easier for students with diverse learning needs to connect with other students – a big challenge in a big high school of more than 1,900 students. 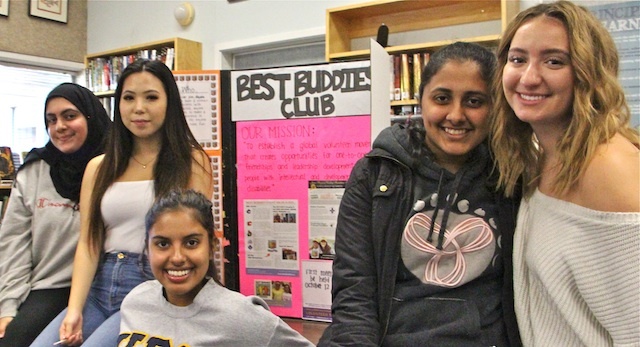 Their Best Buddies club, now in its second year at NWSS, was launched to create opportunities for one-to-one friendships, and to help address the potential isolation of students with special intellectual and developmental abilities. The question was how best to do that? “High school iself is hard to manage on your own…It’s just nice to have a support group, and have people that you know care about you,” said Choi. Grewal and Choi came up with the idea of creating a space in the school that would bring students together to have fun in a way that encourages inclusivity and acceptance. They thought an expanded games room could do the trick – and make kindness stick. The students applied for a Shaw 2018 “Kindness Sticks” grant of $5000 to buy new technology, furnishing and games – everything from board games like Operation, Sorry! and Let’s Go Hiking, to video games like Super Mario Party. Their idea caught the attention of a national panel of 10 judges on the Shaw “KindnessSticks” selection committee. The panel of artists, educators and athletes includes Rick Hansen, the “Man in Motion” and six-time Paralympic medalist who created the Rick Hansen Foundation with the goal of removing barriers for people with disabilities. The panel also includes Manny Arceneaux, BC Lions Wide Receiver and Canadian Football League All-Star. All members of the panel are committed to preventing bullying. The judges are helping Shaw award 10 different schools across Canada with a $5,000 Kindness Sticks grant to help bring their ideas to life. Grewal and Choi were thrilled when their idea was recognized for contributing to a positive school environment. The Games for Everyone initiative encourages students to get involved, and has impact and reach on the lives of others. 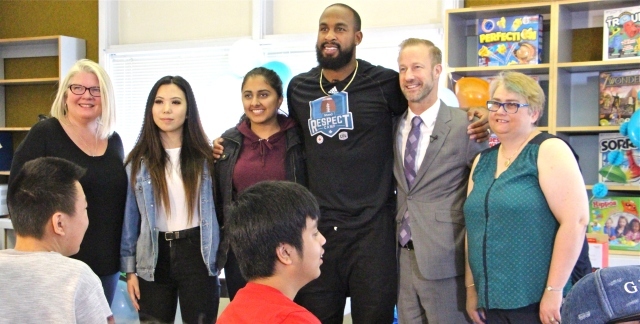 “Everyone – whether in the workplace, the community or in sports – wants to feel a part of something,” said Arceneaux, who visited NWSS for the Games Room opening celebration in October. Shaw Communications was on hand to shoot a video highlighting the NWSS initiative, showing students and friends helping set up games, tables, balloons and snacks to celebrate the new space. The video is now being showcased on the Shaw Communications website with the NWSS Games For Everyone initiative featured as the first 2018 Kindness Sticks Grant recipient. The Best Buddies club was created in 1989 and has spread to become part of more than 1500 colleges, high schools and middle schools globally. There are more than 450 clubs in Canada. Another Best Buddies initiative is being launched at New Westminster Schools at École Qayqayt Elementary School – starting next week.